Why would you want a domain? Many indexers will think that if they don’t have a website, then they don’t need a domain but actually having a domain has serious advantages for client communications. A domain allows you to have a more memorable email address that never changes, even if you change your internet supplier or email account. This means that your clients can still find you, even if you haven’t been in touch for years; saves you the work and time of sending out change-of-email-address messages (and hoping they remember to update their address books) and perhaps the cost of reprinting stationery and business cards. Getting your own domain is not expensive – only around £5 per year – and this article will take you through the process step-by-step. A domain must be unique and consists of a part before the dot and the part afterwards. For example, my domain is “jalamb.com”. The bit afterwards can be .com (for companies), .org (non-profits making organizations), etc., or something country based, such as .co.uk (for UK companies), but there is no enforcement of these rules. 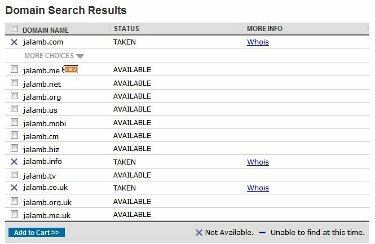 Anyone can buy any domain, as long as someone has not got it already. So the first thing to do is to think up a suitable name. This, I personally think is the hardest part of the whole process – should it be business oriented, like indexes4u or name oriented, like jalamb? Do you want to convey an image of corporate reliability or personal-level service? 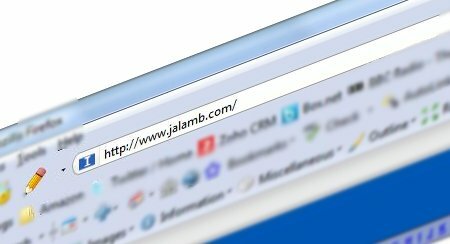 Domain names are NOT case sensitive, so jalamb is the same as JALamb, and can contain letters, numbers and hyphens, but take care that it conveys what you want. There are the cautionary examples of Experts Exchange who chose the domain expertsexchange.com (and who have now added a hyphen to avoid confusion), WhoRepresents.com and others. Enter your chosen name, press Search, and you will be presented with a list showing you whether the domain you requested is available, along with the availability of that name combined with a number of other suffixes, such as .co.uk, .net, etc. If your chosen domain is not available, and you are not happy with any of the alternatives displayed, then you can click on the “Search by Keywords” tab, enter two or three keywords, and have it make suggestions. Once you have purchased your domain you are presented with a sophisticated control panel with lots of options. On the left hand side is a small heading, Email Management. You are presented with a form with two columns: “User Name” and “Forwarded To”. “User Name” is the part of the new email address you are creating that goes before the @ sign, and “Forwarded To” is your full, existing email address that you want the incoming emails to be sent on to. I can then enter my current email address, “james @ jalamb.f9.co.uk”, and any mail sent to the new address will be redirected to it. When I look at the email I receive, it will still say on it “To: james @ jalamb.com” so I can see the address that the sender used. The updates here are immediate, so when, for example, a few months ago my email provider had a problem and my email stopped working (for a week, as it turned out) I could redirect my email temporarily. I went onto Googlemail and created an email account, “james.a.lamb @ googlemail.com”. I then went to the Namecheap control panel and changed the forwarding to direct james @ jalamb.com to the new Googlemail address. Communications with clients continued seamlessly and uninterrupted. They were completely unaware of any change; I didn’t have to send them embarrassing emails, nor rely on them to change their address books. Of course, it is important that you actually notice that there’s a problem with your email that you need to do something about. If you don’t get any messages for a day, how do you know it isn’t just a quiet day? What I do is subscribe to some daily feeds. It doesn’t really matter what these are, so long as they send you an email every day. At the bottom of all the BBC News sites there is an “email news” link. Sign up and they will send you a daily email of the day’s news. You don’t even have to read it but, if it doesn’t arrive, the real news is that you might have a problem with your email.